Add support for Contact Form 7 to attach property details to the contact email sent from WPCasa listing pages. 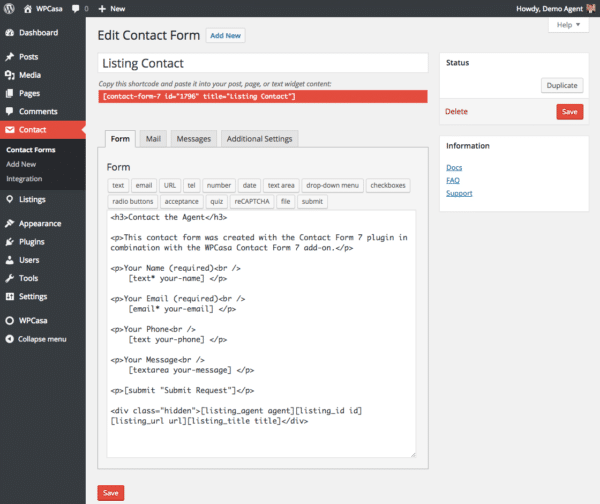 WPCasa Contact Form 7 is a bridge plugin for one of the most popular free contact form plugins out there. Contact Form 7 is very simple but just as flexible. With our add-on we make sure that property information can automatically be attached to emails sent from listing pages. Further it creates a starter form with all the necessary fields. Automatic installation is the easiest way to install WPCasa Contact Form 7. Log into your WordPress admin and go to WP-Admin > Plugins > Add New. Then type “WPCasa Contact Form 7” in the search field and click Install Now once you’ve found the plugin. 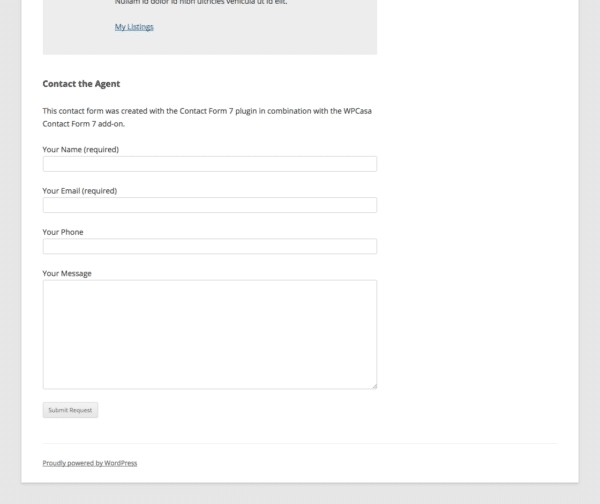 When the Contact Form 7 core plugin and our add-on are activated you can visit the form builder on WP-Admin > Contact > Contact Forms and will find the Listing Contact form that you can change to your needs if necessary. Heads up! This is an add-on plugin and will only work in combination with the WPCasa and Contact Form 7 core plugins.